Dan Brown may be the bestselling author of plenty of intricately plotted thrillers, but those accolades have, unfortunately, made him a little overconfident in his puzzle-solving abilities. 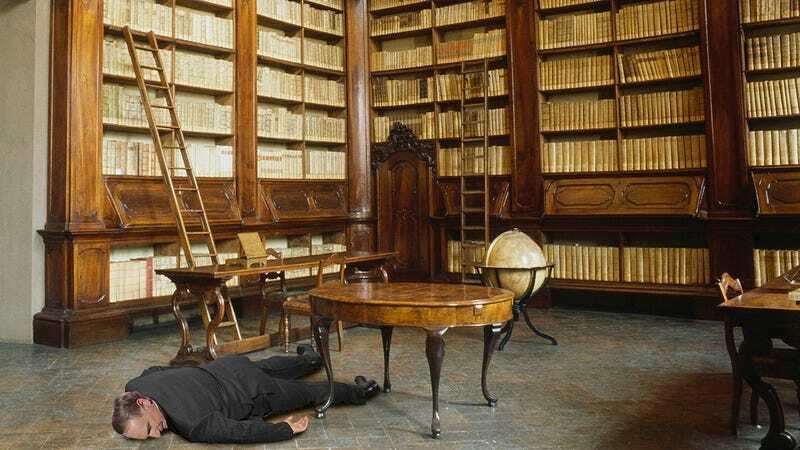 Case in point: The Da Vinci Code author has passed out while trying to do an escape room by himself. Ouch. You never want to see something like this happen. According to employees, Brown showed up this morning at Boston-based escape room company Ultimate Escapism, purchased a single ticket for its “Dark Manor” challenge, and demanded “absolute solitude” to complete the puzzle. Brown, refusing to be grouped with an already existing party, apparently proceeded to purchase 10 tickets for a one-hour package, giving the Ultimate Escapism employees no choice but to give him a solo Dark Manor room escape experience. Once inside the escape room, Brown immediately took a piece of chalk out of his pocket and began drawing a grid over the floor and walls of the Victorian-style study, which he labeled with Greek letters and then Hebrew letters when he ran out of Greek. Entirely ignoring the letter on the table meant to point players toward the first puzzle—a simple sequence of piano keys based on the first letter of each paragraph—Brown instead began tiring himself out at a rapid rate, connecting every candlestick with a ball of red yarn from his other pocket. While Brown was reportedly still conscious at the 60-minute mark when the room’s time limit expired, a visibly exhausted, sweaty Brown was not ready to leave, and after shedding his sopping-wet suit jacket and vest, he barricaded the door shut with a heavy oak chair to keep any Ultimate Escapism employees out of the room. The physical strength needed to lift the chair, however, left the writer severely winded, and forced him to sit with his head between his knees until he could return to his task of mapping the stations of the cross onto the layout of the study while consulting an alphanumerical cipher of his own devising that he’d scrawled on his forearm. Soon after, though, Brown’s exertions took their toll. The effort of repeatedly pacing the room to measure its dimensions in cubits, along with the strain of heaving back one of the bookshelves to reveal a troubling wallpaper pattern and the intriguing scent of linseed oil, proved to be too much for the already weakened author. After staring woozily at a painting of a baroness while running his fingers along the frame, Brown staggered onto the carpet and collapsed, knocking over the elaborate device he’d jury-rigged to reflect light from the chandelier onto the piano’s sheet music in the process. Yikes. Here’s hoping this Dan Brown thriller has a happy ending. Although Ultimate Escapism employees eventually became aware Brown is unconscious, at first, they were unable to assist him, as the door remained barred shut. So, if you’re waiting for the next Robert Langdon mystery, you might want to keep your fingers crossed until the paramedics can break down the door and solve the escape room enough to pull the famous author out and take him to the hospital. Good luck, Dan!